When researching a project it is very important to look at existing designs. Often the best ideas are developed from existing designs because they can be improved and lessons learned from earlier mistakes or design faults. Can you think of a product that you use regularly that could be improved? When researching it is important that you collect pictures of existing designs and place your thoughts, in the form of notes, alongside each. 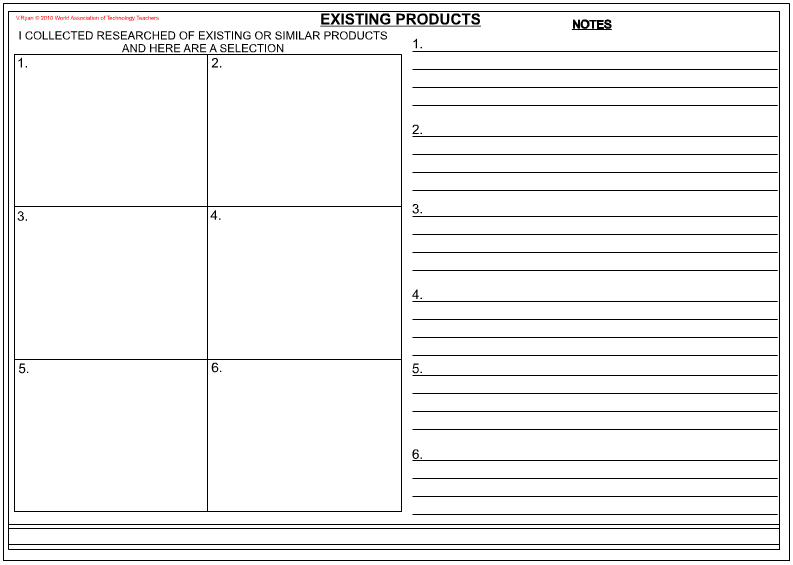 The’ existing products sheet’ shown below shows a collection of board games / toys for a young child. 2. Place notes alongside each. These should explain where you found the design (ie. 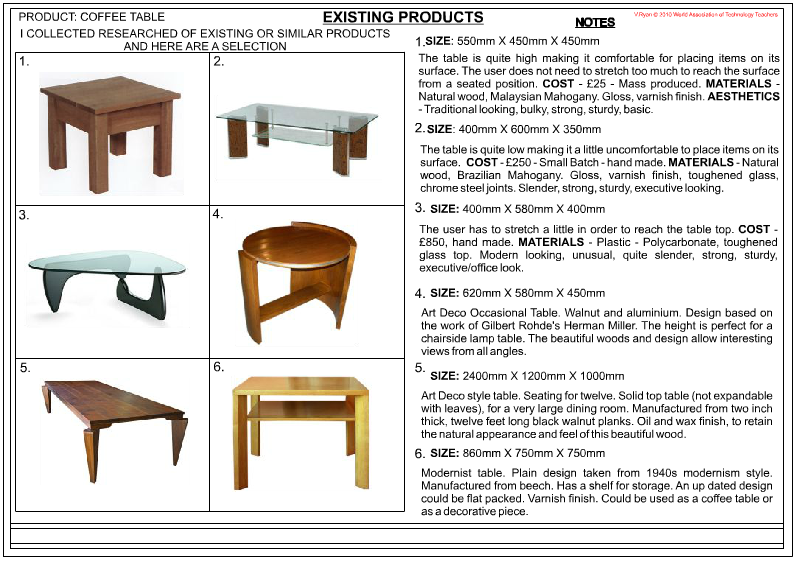 website address or catalogue name), the aspects you like about the design and those aspects that could be improved. 3. Describe the product, how it works, its functions, aesthetic qualities, overall size, ergonomics, materials, cost, colour scheme etc..... and the safety of the device. 4. The quality of printout is important. It should be clear and show detail and be in colour if possible. 5. Display designs that are different. Do not display ideas that are virtually the same. The aim of this research sheet is to show that you have researched a range of existing ideas as this will help you design your own idea. 6. Say if you think the existing idea is suitable for the age range / target market you intend to design for. 7. When writing negative points about an aspect of an existing idea, always explain your reasons and how you consider the aspect could be improved. 8. Ask the views of other pupils. You could describe the views of a range of people on each of the existing designs you have selected. 9. Take a photograph of you testing / evaluating an existing product. This is called ‘primary research’. This is original research and will help you gain a good grade for this section of the design process. A. Collect catalogues, photographs, photocopies of exiting products, from a range of sources. B. Place the existing ideas in order. Start with the best an lead to your least favoured. D. Ask the views of other people. You could present this design sheet in the form of a questionnaire.